In this book Hazel Blomkamp uses a wide selection of materials to update techniques and inspire embroiderers to explore whilst working loosely within the confines of crewel work styles. Projects including beads and metal threads to add sparkle and texture to your work. Monochrome embroidery making use of a variety of threads and beads, all within the same colour range. 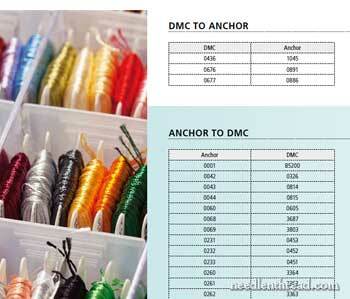 Techniques employed in needle-made laces with designs defined by means of texture. to provide texture and interest. 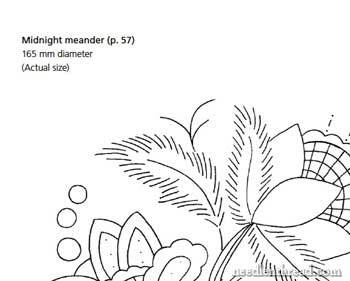 This is a soft backed book containing 143 pages of instructions on how to embroider six patterns. It is beautifully presented, using excellent photography and clear explanations to guide you step by step through each pattern. The designs are for use in fire screens, cushions, trays, box lids, runners and a doorstop, or adapted to whatever you fancy. 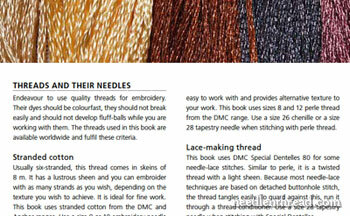 There is a very explicit section on how to work the traditional stitches and some variations. 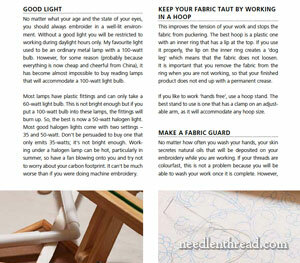 Handy tips run throughout the book, charts guide you through the colours used. This book aims to give you techniques to create your own modern version of Crewel work incorporating beads and metallic threads and using stitches from other forms of needlework. 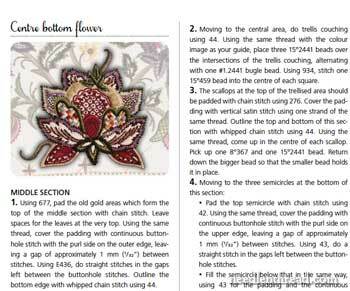 The start of the book is packed with useful tips and a comprehensive stitch gallery with clear diagrams and easy to follow instructions. 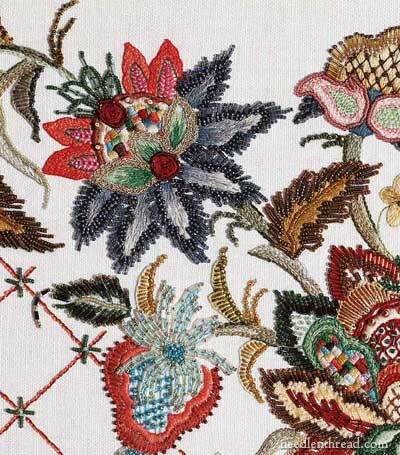 The rest of the book comprises of projects split into the following categories: beaded Jacobean embroidery, borrowing techniques from needle-made lace and creatively traditional. 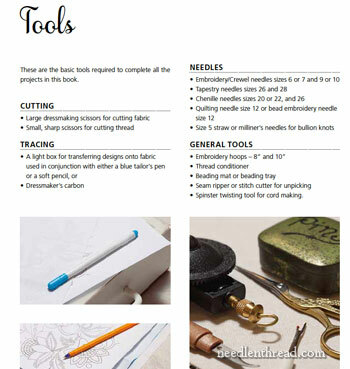 You can find the patterns for the projects in the back of the book, most of them do need enlarging. 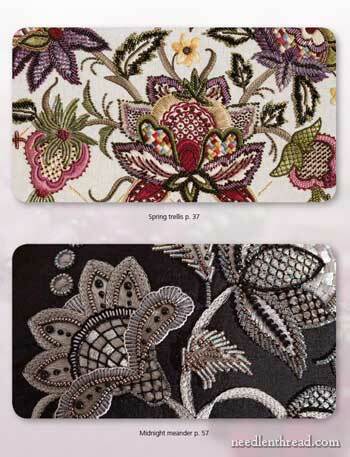 The use of beads and metallic thread really bring a new modern twist to the designs featured in this book. 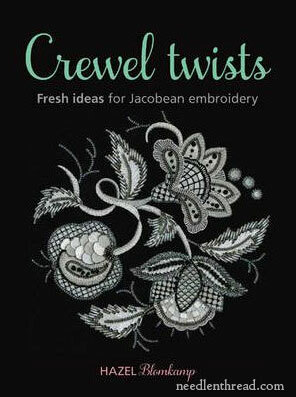 Lovers of Jacobean or Crewelwork embroidery will love Crewel Twists by Hazel Blomkamp. The author takes a new approach with the traditional techniques of this form of embroidery to create six splendid projects you will find difficult to resist stitching. All the stitches used are illustrated with large, clear diagrams, along with lots of general advice, and each design is broken down into easy to follow steps. 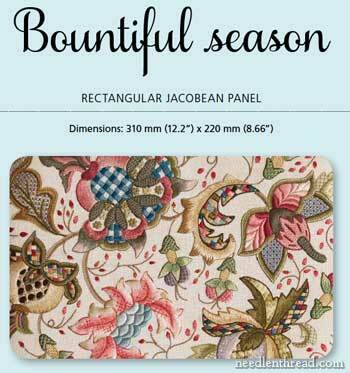 For embroiderers looking for some inspiration, Hazel Blomkamp's book is an exciting take on Jacobean embroidery. 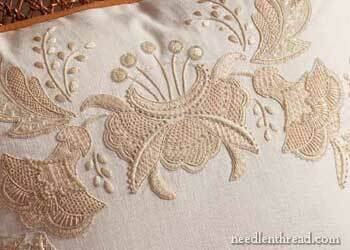 It uses a wide selection of materials to update techniques within the confines of this classic crewel style. 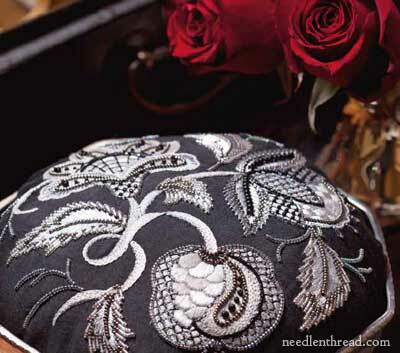 The original designs include incorporating beads and metal threads to add sparkle and texture, monochrome embroidery and needle-made laces a delightful resource. Crewel work is often called Jacobean embroidery but that's more to do with the designs than with the techniques. Traditionally stitched in wool, these crewel work designs are worked in a variety of threads, including stranded cotton, stranded rayon, cotton pearl and even lace-making thread. Beads, sequins and metallic threads are used to add sparkle and texture and the resulting glitz really lifts the designs. 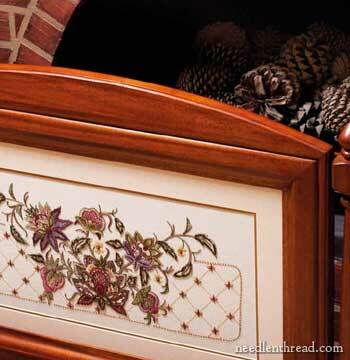 Needle-lace stitches add another dimension to the embroideries, and traditional embroidery stitches such as satin stitch and many variations of trellis filling showcase the qualities of the different threads. Working with a fairly broad definition of crewel work, the ideas and stitches allow embroiderers to borrow techniques from other styles of needlework and produce a piece that is still recognisably Jacobean in style. A lovely book it really makes you want to reach for your needle. I have been a keen embroiderer for years and confess a love for Jacobean (or crewel) work but I have never attempted it. This is because I am allergic to wool, and as embroidery experts have told me many times, you have to work this style in wool. But rules are made to be broken, and somebody has now done just that and produced a whole book of Jacobean embroidery where no sheep have been involved.Cotton floss, shiny rayon threads, metal goldwork strands and beadsyep, got all that right here and used it for years. Feast your eyes on this sumptuous treat of a book and look at all that lovely Jacobean work made using these modern and wool-free materials. To begin the author goes through all the aspects of starting that often get forgotten. These include how to obtain the right glasses if you need them, how to keep the work free of grubby marks and other helpful tips. 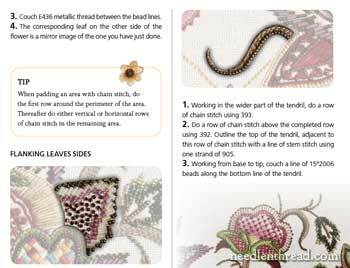 Choose your fabric, get the right threads and tools and then practice the stitches shown over the next few pages, including needle lace. Most of these are unique to Jacobean work and quite complex; they are explained with a single drawn diagram showing the stitch being done and with a few words on working. No, this is not a suitable book for total beginners but anybody who is au fait with embroidery and has made a few projects ought to be able to make something to be proud of. All the projects have been made into items other than pictures; there is a box, stool and several cushions and pillows instead. They are beautiful too, shining with vibrant colors in most cases or worked in monochromes or shades or ecru and featuring those lush florals admired in stately homes and museums. The instructions are detailed but aimed at intermediate and upwards stitchers on the whole but nothing wrong with that as there are plenty of other books on this subject for beginners. 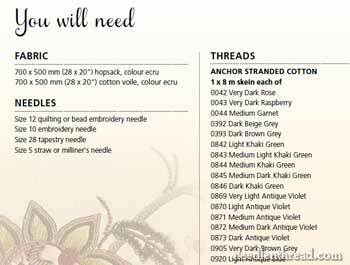 This is a beautiful book that will make any embroiderer itch to start stitchingbut not because of any wool! Whether you know it as crewel or Jacobean, this free form of embroidery has been around for centuries and is still popular today. Hazel Blomkamp uses a wide selection of materials to update the techniques in Crewel Twists: Fresh ideas for Jacobean Embroidery, whilst working loosely within the confines of crewel work styles. This particular project is worked in grays and whites and silvers and black – an elegant combination. Incidentally, this is one of the projects Hazel will be teaching at Beating Around the Bush in Australia this April. I like the clever finishing for this one – it’s mounted in a silver candy dish!